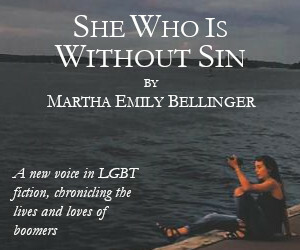 “The Closet” is an increasingly ill-fitting metaphor for queer men and women who wish to explore their sexuality outside of the two opposite states of either being “out” and having to confess their personal life aloud and align it with a specific identity category or being “closeted” and thus presumed to be living in shame, secrecy, or self-denial. 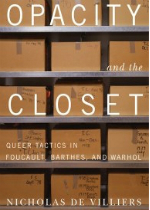 It is this binary of being in or out of the closet that Nicholas De Villiers deconstructs in Opacity and the Closet with the advancement of a practice he terms “queer opacity.” Laying out the thesis of the text, De Villiers writes, “This book interrogates the viability of the metaphor of the closet and puts forth a concept of ‘opacity’ as an alternative queer strategy or tactic that is not linked to an interpretation of hidden depths, concealed meanings, or neat opposition between silence and speech.” Queer opacity is not the transparency of being “out” nor is it the concealment of being “in,” but it is instead a practice of queer living that resists confession, fixed identity categories, and public visibility as obligatory elements of LGBT identity. De Villiers’ three case studies on practitioners of queer opacity, French philosophers Michel Foucault and Roland Barthes, and American art icon Andy Warhol, have all greatly influenced the study and expression of sexuality in contemporary culture. Yet, none of the three ever fully came out of the closet in any conventional sense. All three engaged openly with gay themes in their work, and Warhol never denied his sexuality, but none of the three ever became openly gay self-identified voices of the community. 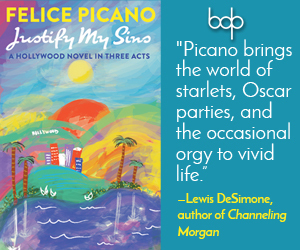 It would be convenient and easy, as many biographers and cultural critics have done, to fault these men for not declaring their identity according to contemporary gay cultural standards set long after their deaths or to perform some one-size-fits-all, pop psychoanalysis to locate the source of shame or guilt that we have been taught to believe is the source of our sexual discretion. But instead, De Villiers’ concept of queer opacity allows us to see the sexualities of these men as they truly were expressed by widening our narrow narrative of sexuality to encompass the peripheries where the genius of these men flourished. Instead of seeing them as closeted, De Villiers praises their queer opacity for inventing new methods of queer expression and transgression. For an object to be opaque, it is visibly present, but difficult to make out or obscure, like a figure standing behind a marble glass shower door. De Villiers’ does not claim that he has figured out a way to remove the shower door and expose the naked Foucault or Warhol behind it, but instead that the opaque forms and gestures are the subject himself. Opaque tactics do not hide the truth; they are the truth—the truth that there is no essential, locatable truth to one’s sexuality. This theory of queer opacity is most accessible when De Villiers applies it to the life and works of Andy Warhol. As a pop artist, Andy Warhol’s work was a celebration of the surface—the flat, but bright and shiny logos, icons, and images that populated consumer culture. While they imply the depth of social critique, it would be a mistake to assert a specific, intentional statement in Warhol’s soup cans and Marilyn Monroe prints, just as it would be a mistake to think that Warhol’s legendary shyness, awkwardness, and contradictory behaviors concealed a hidden, refined sexuality accessible through analysis. Instead De Villiers argues we should believe Warhol when he said he wanted “to be a machine” and take him at his word when he said, “If you want to know all about Andy Warhol, just look at the surface of my paintings and my films.” Warhol’s queer opacity was not a way to evade the truth of his self, but that his true self was defined by his constant toying with identity. Beyond the fresh and highly original studies of these three iconic queer intellectuals, the book’s most vital contribution to queer studies will be the theory of queer opacity. Queer opacity is a more accurate way of describing how sexual identity is never fully in nor out of the closet, but in a constant state of management and engagement with varying degrees of obscurity and clarity. Thinking of queer identity as tactical deployments instead of a struggle to realize an optimal self reverses the history of interrogations, confessions, and diagnoses that queers have faced and instead empowers the individual to revel in illegible acts of queerness from the revolutionary to the absurd.